On October 24, 1877, the Goodspeed Opera House on the Connecticut River in East Haddam officially opened to the public with the productions of Charles II, Box and Cox, and Turn Him Out. Designed by Jabez Comstock and built by local businessman William Goodspeed, the building’s main floor served as a store, office, and steamship docking point, and the top two floors served as a venue for live performances. After Goodspeed died in 1926, the Second Empire-style building fell into disrepair and was used for a number of purposes, including as militia base during World War I and a Department of Transportation storage facility. In 1959, concerned residents formed Goodspeed Musicals in order to restore the building and bring back theater performances. 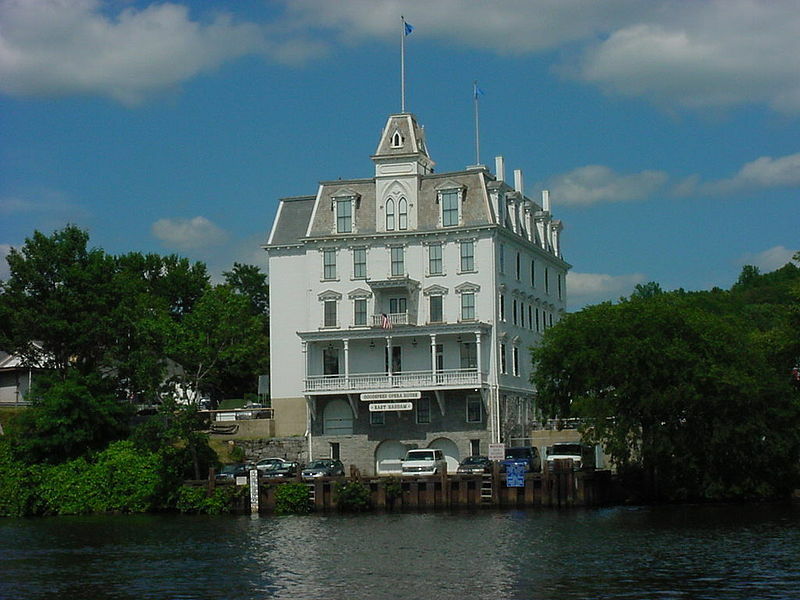 The Goodspeed Opera House reopened in 1963 and continues to operate today as a theater. Since 1968, sixteen productions that originated at the theater have gone on to play on Broadway, and Goodspeed productions have won more than a dozen Tony awards.